We know now that Leadership skills can be taught. Leadership skills are not "Gifts from the Gods" bestowed on only a selected few. Leadership skills are not a part of the genetic code. There is no such thing as a "Natural born leader". Leadership skills are SKILLS. They are very easily learnt. In essence, leadership boils down to learning and applying the seven steps of the Success Formula Cycle. The Success Formula is a continuous improvement cycle. The Success Formula is a system of seven steps that are continually repeated, every single day. This diagram, shows how seven steps are related. If you study the Success Formula Cycle, you will notice that it suggests a series of seven questions that you could ask every day. Have a look at the formula, and you will see the following seven areas of interest. What is the purpose, or goal? What is the detailed written plan? What are the top priority actions? What positive feedback results have we been getting recently? What negative feedback results have we been getting lately? What can we learn from the negative feedback results, which we can now use to make adaptive changes to our original plan of action, that will improve the current situation and get us closer to our goal? In relation to what is already going well; what can we improve upon and make it even better than it currently is? As part of your leadership training, it would be beneficial to memorise these seven questions and ask them of yourself and others, every day. The act of asking these questions compels your mind to think in terms that are consistent with the success formula. If your mind is thinking in terms that are consistent with the success formula, then you will inexorably be drawn into successful results, because; you become whatever you think about. The Magnificent Seven Success Formula questions never change. The Magnificent Seven Success Formula questions are the best way to ensure that your mind is functioning as it should. Your mind is designed by nature to be a goal striving, problem-solving, action-orientated, success mechanism. If you use it as such, you will get the best performance from yourself. You will feel terrific as you make progress towards ever higher levels of personal achievement. The Magnificent Seven success formula questions never change. Once you know them, you know them. They are invariable, immutable and you could easily commit them to memory. Although the questions never change, what DOES change are your ANSWERS to the questions. The answers to the questions are different for every individual. And the answers to the questions are always changing. To be a leader, all you have to do is to keep asking and answering the same Magnificent Seven Success Formula questions in the order that they are given. The answers you give to these questions will form the basis of today's plan of action. The formula is so simple a child could do it. In fact, children DO do it. Children use the success formula all the time, except that they do not write their plans down, they just act: they look at the feedback results, and they continually and rapidly change. Children make continuous, progressive, evolutionary changes to their behaviours, every single day. In their preschool years, children make huge and uninterrupted progress. Then, somewhere along the line, they change. They stop using the success formula, because somewhere along the line, they learn to avoid negative feedback, criticism and change. Children grow up and they drop off the success formula. They become afraid to set high-value goals; they become afraid of negative feedback; they start to crave praise and positive attention. They become resistant to change, and they start to fight any suggestion that they should improve upon their current levels of performance. Children grow up and become adults. And in the act of growing up, they lose that capacity for rapid development and adaptive change. In order to regain that ability to make rapid progress, like we all did when we were kids, we need to rediscover what we instinctively already know. We need to rediscover the success formula. The basic success formula is PURPOSE, ACTION, FEEDBACK, CHANGE. In the adult version of the success formula, we have an advantage over the kids. We can insert "Detailed written plans". We don't have to act like children and use blind trial and error learning. We can think it through and plan our responses in writing, in advance of taking action. Kids can't do that. But we can. So the adult version of the success formula includes detailed planning. Clear purpose, detailed written plans, consistent action, gather the feedback, make adaptive changes and keep making progress based on the feedback results your current actions are creating. It seems simple. And it is simple. But it is not easy. The success formula is simple, but not easy. It is simple to ask the questions, it is not always easy to answer them, and it is never easy to rewrite plans, take new actions, absorb criticisms and defeats; and make yet another change. That is not easy. But you can do it. Because if you do it, you will be living a dynamic and progressive existence and if you don't do it, then you will be living a static, non-progressive existence. Exercise Using the Success Formula Questions. Let us go through the success formula questions with you right now. Before we start, we need to set the context, either a work or a hobbies context. Let's assume you have a hobby. What is your hobby? Please answer the following seven questions as fully as you are able, about your hobby. What is your goal for the next six months? What would you like to achieve? What is the detailed written plan? Write out the steps or plan, that you would need in order to achieve the goal. What are the top priority actions? You cannot do everything at the same time, so what are the very first things you could do, starting tomorrow, that would make the biggest difference? In relation to your hobby, what positive feedback results have you been getting recently? In relation to your hobby, what negative feedback results have you been getting recently? What can you learn from any recent negative feedback results which you could now use to make adaptive changes? In relation to your hobby, what is already going well; what can you improve upon and make it even better than it currently is? As part of your leadership training, you need to have good answers to all the Magnificent Seven questions. Most people don't ask these questions, and therefore they don't have answers to them. Leaders do ask these questions, and therefore they do have some answers. THAT IS WHAT MAKES THEM LEADERS. 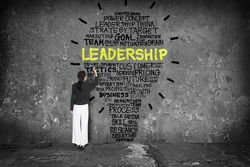 If you want to develop your leadership skills, understand, memorise, ask and answer the Magnificent Seven leadership questions. Try our quiz to discover whether you have what it takes to be a good leader. If the Success Formula is so Simple, Why Isn't Everyone Doing It? The success formula is simple to understand. It consists of only five major ideas: Purpose, plan, action, feedback, change. So, the obvious question is, if the success formula is so simple, why isn't everyone doing it? A leader does not feel the need to seek the approval of others. A leader makes his own motivation and validation. Leaders have an 'internal locus of control'. Leaders are self-reliant.